The BOSS (Best of Show System), in pneumatic form! Since its introduction in June 2015, the BOSS polishing system has taken the world by storm, with its systematic approach that’s so easy to use even beginners can reap the benefits of the tools, pads and chemicals. The new BOSS G10 picks up where the G15 and G21 electric polishers left off. The BOSS G10 is a finely-balanced random-orbital pneumatic polisher that features a large 10mm throw, enabling you to create perfect paint with just the palm of your hand! You may be wondering what advantage the G10 holds over an electric dual action polisher in the same price range. It’s simple! The G10 is compact and it weighs next to nothing, making it possible to use the G10 ONE HANDED! 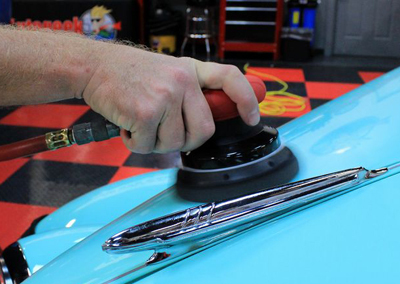 Plus, we all know that big air compressor sitting in the corner of your garage only gets used twice a year, so why not put it to work and incorporate it into your detailing regime? You’ll be floored at just how powerful and smooth the G10 really is. The BOSS G10 is compact, weighs next to nothing, and it's powerful enough to effortlessly rotate a 6.5 inch foam pad! The BOSS G10 Pneumatic Polisher delivers exceptional performance while its machined steel counterbalance, ergonomic palm grip, and smooth operation add comfort and convenience to your paint care regime. Its unique pneumatic motor efficiently generates tons of torque with modest air flow requirements. Pair THE BOSS G10 AIR with BOSS Pads and Creams or other quality liquids like Liquid Gloss Poly Wax and produce results that will turn your neighbors' heads. Powerful air tools generally require an air compressor the size of a Hyundai to operate efficiently. That’s not the case with the new G10 Pneumatic Polisher, because it only requires 2 CFM at 90 psi! Pick your backing plate at the drop down below. Griots Garage 5.5 inch BOSS Foam and Microfiber Pads - 6 Pack YOU CHOOSE!